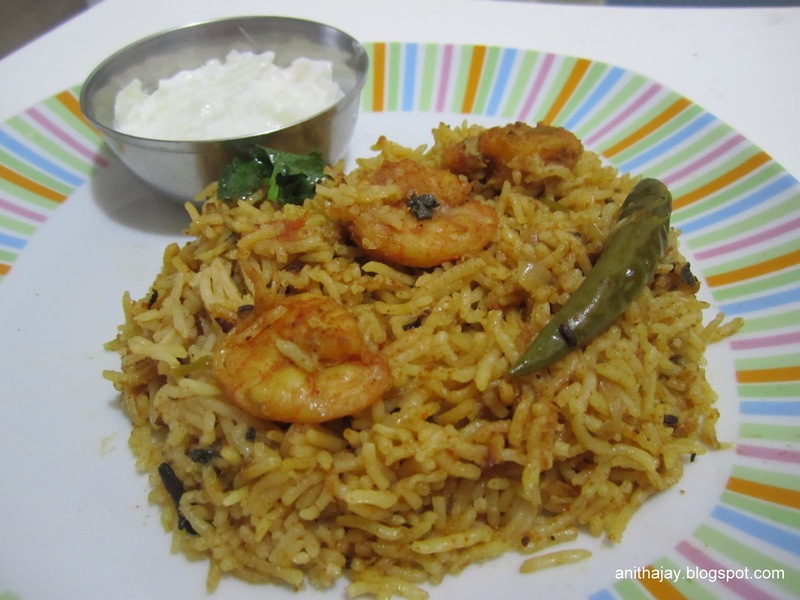 I always thought to make Briyani using Prawn but hesitate to do so. Because i thought the prawn smell will ruin the Briyani taste. This recipe doesn't have any prawn smell and tastes very good. The Prawn absorbs the spice masala and also cooked well. Tried this for first time and come out very well. Clean prawn and marinate it with 1/4 tsp chilli powder,turmeric powder,lemon juice and salt. keep it for 15 - 20 minutes before cooking. Heat oil in a pressure cooker , add the item under To temper , once splutter add ginger garlic paste and cook till raw smell goes. Add onions and cook till it translucent.Add the marinated Prawn and some mint leaves and cook it color turns to white. Now add tomato,chilli powder,green chilli and cook till the spices coated well with prawns. Add 2 cups of water,requires salt and allow it to boil. Once boiled add soaked basmati rice and close the cooker. Cook it in medium flame for 3 hisses. Open the cooker once all the pressure went and serve hot with raita. Can take my eyes from ur droolworthy briyani,full of flavours.